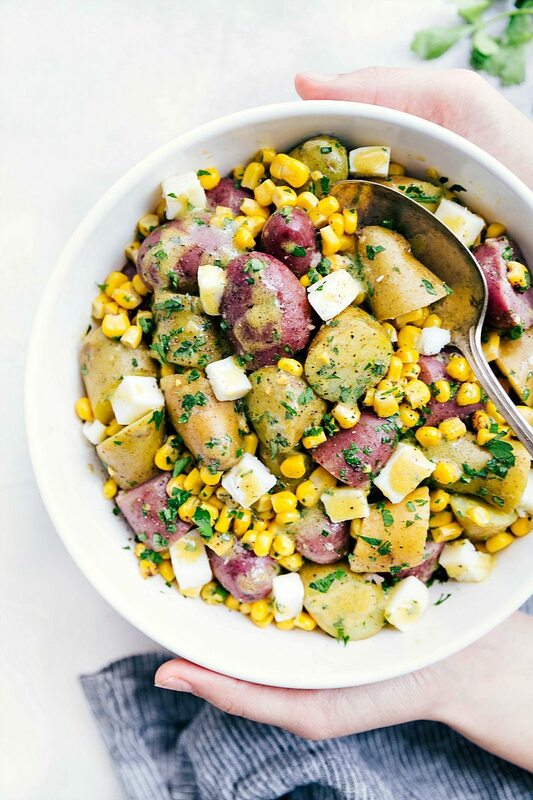 I get that this is kind of a summer recipe, okay really a summery recipe, but sometimes potato salads need to be made in the middle of the winter and I am certain if you try this one you will forgive me for the lack of seasonality with this recipe. 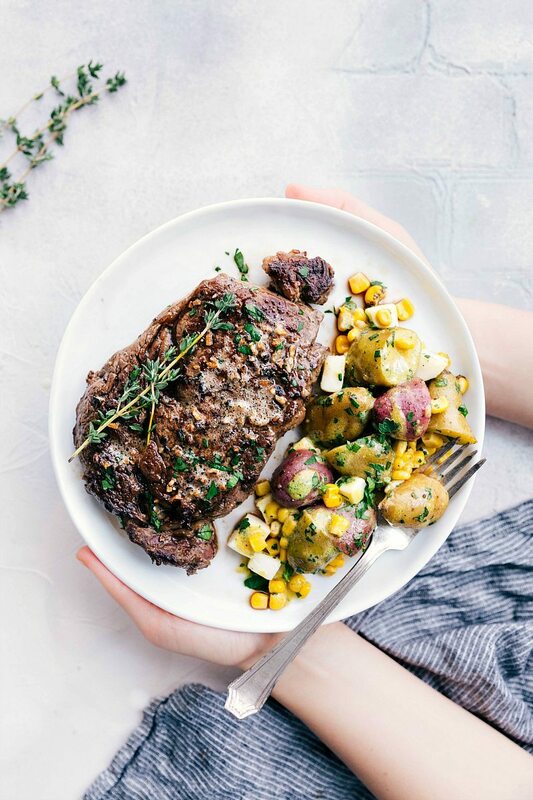 Winter or not, we can’t get enough of this salad lately and it’s the perfect side to a delicious herbed, garlicky, and buttery skillet steak. Which, I did not grill because I am not completely insensitive to the snowstorms and freezing temperatures so many of you are experiencing. 🙂 So I’m sharing how to perfectly cook steaks (in the warmth of your home) in a skillet. If you are wanting to grill this steak; I’ve got a whole guide to grilling perfect steak here. This cold potato salad is pretty unique and not like your typical mayo and hard-boiled-egg-laden salads. It’s light and tangy and has all the perfect textures and flavors. 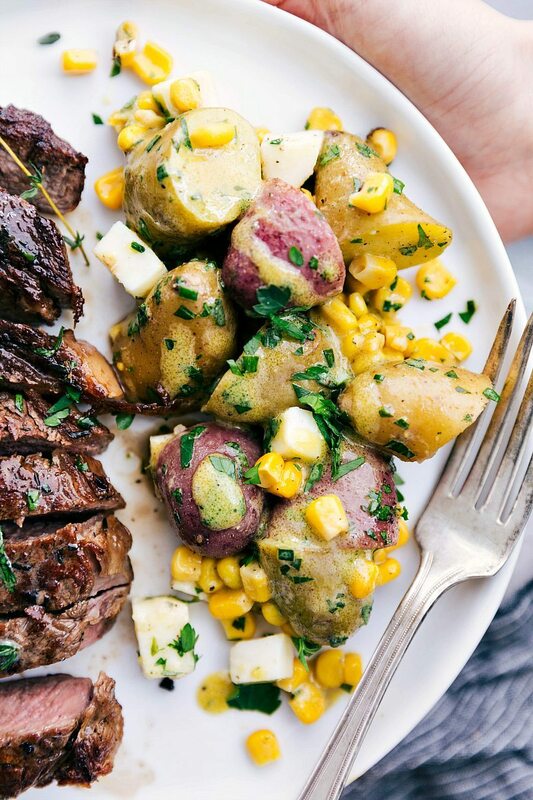 It’s also pretty quick to whip together and the dressing perfectly complements the fingerling potatoes, corn, and mozzarella. Buy the best steak for pan-searing. You’re looking for boneless steaks that are 1 to 1 and 1/2 inches thick with lots of marbling (the white fat you can see on the meat). You want a steak to have enough fat that it can remain juicy during the cooking process. Salt the steak and add spices AFTER searing. First off, you don’t want to add other spices or herbs (or even cracked pepper) to the steaks at first for a good pan seared steak. The reason is the hot pan is going to burn those spices before they have a chance to add any flavor to your steak. The one spice you do want to add before cooking is salt. I like to pat the steaks dry with paper towel and then generously salt the steaks (with coarse sea salt) about 30 minutes before cooking them. Seasoning the steaks with salt is going to help create a dry surface which will give you the perfect sear. Don’t add oil or butter at first: You’ll notice this recipe doesn’t call for any oil or butter at the start of cooking and you might be worried your steaks are going to stick to your skillet. But trust me, the steaks will flip just fine without the butter or oil (as long as you’re using a very hot cast iron pan, sticking shouldn’t be a problem.). Oil and butter can inhibit browning which will result in a slow sear. Cook the steaks hot and fast! You want to use your heaviest pan (I highly recommend a good cast iron pan) over high heat and get it really hot before you even add the steaks. The heat in that pan is what will give you a perfect crust on your steak. We’re giving the steaks a good sear which will create a crisp crust on the outside and give your finished steak tons of flavor. Keep those stakes moving (flip or turn them every couple of minutes) to create that perfect even crust. Once the steaks are halfway cooked is when you’ll add in those herbs and some butter so you can baste the steak as its finishing. Cut the cooked meat against the grain: When you slice steak against the grain you’re creating shorter meat fibers which will give you an easier-to-chew (more tender) piece of steak. The “grain” on a steak is the long striations that run across a steak (usually they go tip to tip). You want to cut across or against those long striations. How do you know when your skillet steak is cooked to your liking? I’ve found the easiest way to determine the doneness of the steaks is by using a thermometer. With all of the varying factors at play (the actual steak (thickness, temperature, etc. ), the pan, your stovetop, etc.) I always think a thermometer is the safest way to make sure you get the steak exactly where you want it. I’ll also pull it off about 5-10 degrees before it’s where I want it, because it will cook a bit more after being removed from the pan. 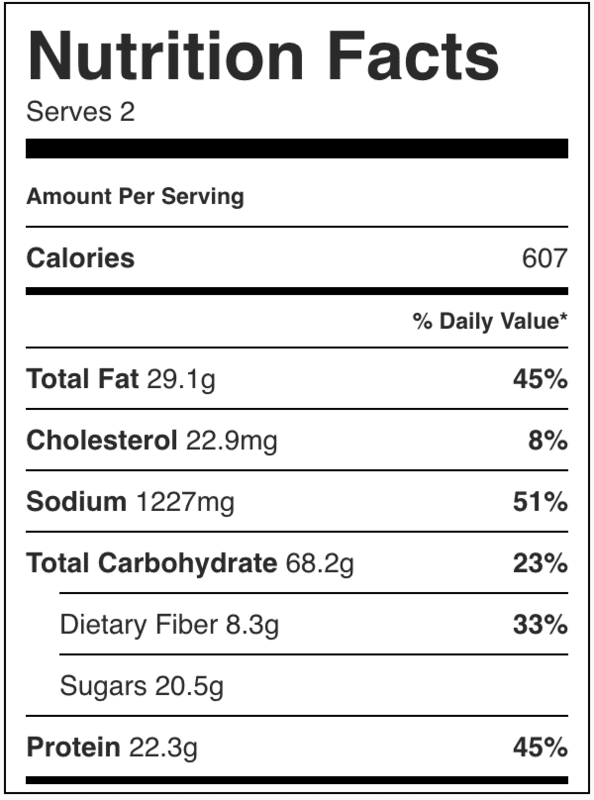 For an “old fashioned” potato salad, check this one out! 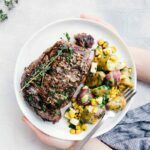 Delicious garlic butter skillet steak with a tangy and delicious potato & corn salad. All the tips and tricks you need to know to perfectly cook a skillet steak! Author: Chelsea, potato salad adapted from Lindsay Hunt's "Healthyish"
For the potato salad: Fill a large pot with about an inch of water. Add a steamer insert, cover, bring to a boil, and then add in the washed and halved potatoes on top. Cook until the potatoes are fork-tender, about 15-20 minutes depending on their size. Remove from the pot and set aside. Let cool completely before tossing with the other ingredients. Once cooled, toss with the corn, mozzarella cheese cubes, fresh basil leaves, fresh chives, and 2 tablespoons fresh parsley. 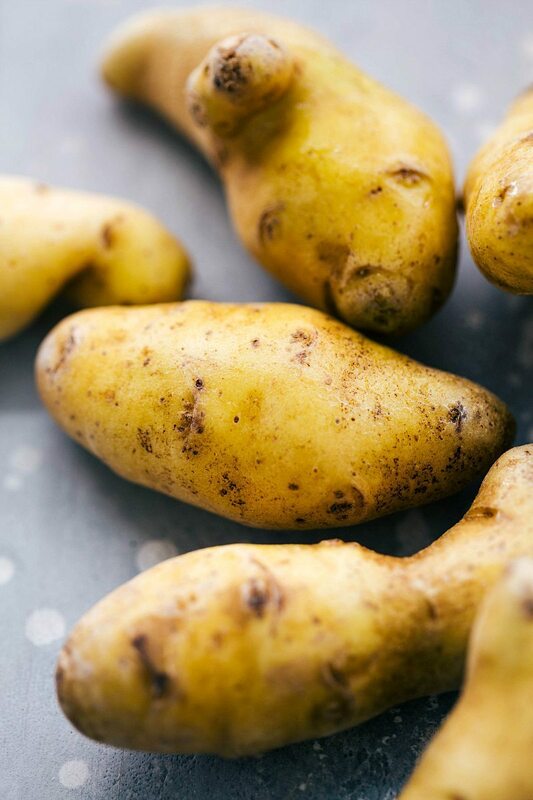 For the dressing on the potatoes: in a small bowl, whisk together the Dijon mustard, apple cider vinegar, honey, and remaining 1 tablespoon parsley. Add salt and pepper to taste (I use 1/2 teaspoon salt and 1/4 teaspoon pepper). While whisking constantly, slowly stream in the olive oil. Whisk until smooth. Pour over the the salad. Toss together and let chill in the fridge until the steaks are ready. Prep the steaks: Remove the steaks from the refrigerator about 30 minutes to 1 hour before cooking. Place them on a paper towel-lined plate and pat dry with more paper towels. This will help dry the surface of the meat, making a better crust. Change out the paper towels occasionally if needed. Prepare the rest of the steak ingredients: Because cooking the steaks will go quickly you want to have everything ready to go! I also like grabbing some plates and a meat thermometer to set near the oven. Heat a 12-inch cast iron skillet over high heat for about 5-8 minutes; the pan should smoke just a bit when it is heated and ready. Just before adding the steaks to the skillet, pat dry with paper towels once more and then liberally coat the steaks with the salt. (Get both sides and the sides of the steaks). Place the steaks in the hot pan and cook for one minute (by then the steaks will have created enough of a crust to be able to easily flip). Flip to the other side and cook for another minute. Continue cooking and flipping for another 3-4 minutes (I flip every 30 seconds or so). Remove steaks to plates and let rest (covered with foil) for about 5 minutes. Make sure to slice the steaks against the grain and enjoy with the pan juices, some finely chopped parsley if desired, and a side of the potato salad. * If using canned corn use fire-roasted and if not use a good frozen corn. If you can find fresh corn grill it up and cut it off the cob! You have my “like” for this beauty ! Thank you so much ! Thanks for the amazing “summery” recipe! It’s great for me since I live in Florida and it’s consistently been in the 80’s for the last two weeks! I especially love the non-mayo based potato salad…I’m going to have to try this really soon! I also love the combo of corn and basil together so I know this is going to be super tasty! Your recipes are extremely similar to the recipes published in Healthyish Cookbook. This recipe is pg 172 in her cook book. Not to mention the sausage, potato, and cabbage recipe you recently published as well. If you drawl inspiration from other recipes it is plagiarism to not cite them.